The equilibrium state of polymer single crystals is considered by explicitly taking into account the amorphous fraction formed by loops and tails of the chains. Using ideal chain statistics, a general expression for the free energy excess of the amorphous part is derived. 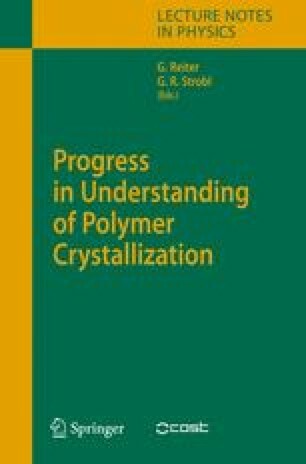 I show that tight loops and close reentries are favored under experimental conditions for under-cooling of polymer single crystals. For many chain crystals, I show that the lamellar thickness increases with the number of chains in the crystal, and that extended chain conformations are thermodynamically favored when the number of chains in the crystal is sufficiently large. The role of finite bending rigidity of chains is discussed for folded chain crystals, as well as tilt effects in extended chain crystals.